A beautiful evening view of Parliament Hill from Nepean Point in the city of Ottawa. The clock tower known as Peace Tower stands in the background. The Parliament Buildings are designed in the Gothic Revival style architecture. The round octagonal shaped structure is Confederation Hall. 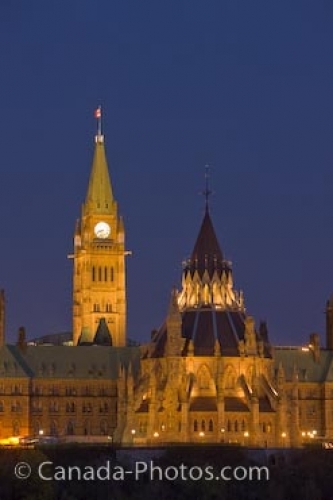 Parliament Hill glows at twilight in the city of Ottawa, Canada.